The appliances arrive and are installed, completing the work on the house prior to the final walkthrough. All utilities are on and the house is now complete. Technology is getting more and more advanced each day. It becomes somewhat daunting to choose which appliances to buy. In order to guarantee a shopping experience that safeguards your money's worth, here are things you should take into consideration before you buy any new home appliances. 1. Money is indeed the most crucial factor to consider in buying new home appliances. With the emergence of items with more advanced features, things are getting more and more expensive. When you are buying new stuff, think of the effects it will have on your budget in the end. If it runs on electricity, make sure you are able to calculate running costs to predict if you are going to have an issue with rising electric bills. 2. The size of the appliances that you will be purchasing should be taken into account. If you already have cabinets installed in your kitchen, you will need to take exact measurements to ensure the appliances will fit properly in the spaces provided. If cabinets have not been installed, you should check your kitchen design or blueprints for measurements to pre-order the appliances. 3. Appliances that are necessary would be a refrigerator, and oven. Some people can do without microwaves and dishwashers, but if you are ever planning on reselling your house, you may want to consider purchasing these appliances and making space for them in your kitchen. When purchasing this number of appliances at one time, the store you are buying from may be able to give you some type of deal. 4. When buying an appliance, there are two things you will need to watch out for. One is an energy-saving trust logo that specifies whether or not the item is an efficient energy-saving product. The other is an EU energy label that measures the degree of the energy usage. For refrigerators, the rating usually comes in the form of A+ or A++ depending on the capacity. Have a sharp eye in spotting these two important labels when shopping for appliances. 5. 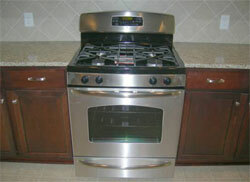 In the process of buying a new appliance, there will sometimes be a need to dispose of older ones. You must be highly responsible enough to know how to do such as some chemicals within these products might prove harmful to the environment. Sometimes it is advisable to donate your old items to charity so there will be no need for disposal. Other options include trading old items for newer ones, or relying on your local civic amenity site to perform the proper recycling method. Take note that some local authorities who specialize in this process might ask for additional charges. It might cost more money than usual, but at least you are doing your part for the environment. 6. The Internet might still prove to be your best friend. It is sometimes ideal to check out online auction sites for any appliances that are being sold for half the price than usual. Take note, however, that not all items are in good working order, so do a bit of research on the seller by checking out his or her reputation in the auction site. Be responsible with whom you are buying from and you will be ensured of an easy and luxurious way of living with your new appliances. In the end, make sure you research the appliances that are right for you. Visit your local appliance stores to get a first-hand look at the appliances that you are interested in. When you are able to see the appliances in person, you will be able to choose the ones that best suit your kitchen style.